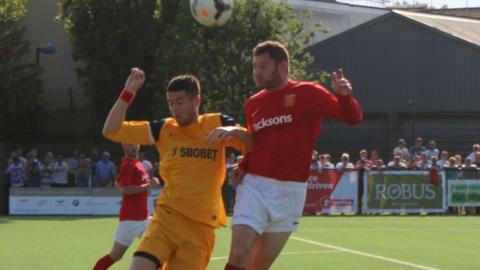 The Jersey Football Association believe they can put forward a good enough case to be allowed to join Uefa. The Channel Island has lodged a bid to become an international football nation with Europe's governing body. But current rules state that only sovereign nations can be admitted. "We feel we've put in a persuasive argument as to why we believe that Jersey would meet the criteria to be accepted by Uefa," JFA director David Brookland told BBc Radio Jersey. Gibraltar are the most recent Uefa member to be admitted, but their application dated back to before the rules were changed in 2001. Jersey's argument hinges on the applications by Kosovo and Greenland, neither of which are independent states, but who are also hoping to join. Faroe Islands - a self-governing country within Denmark Aruba - an autonomous country within the Kingdom of the Netherlands. "If the application of Kosovo is to be dealt with on its merits, and it is expected that a future application by Greenland will be considered when it develops its facilities, then Jersey's application must also be dealt with on its merits," the island FA's bid document states. Jersey has the Queen as head of state, but the island has its own government and the JFA is part of the Football Association in London. "In footballing terms, Jersey cannot be regarded as part of England and there is no United Kingdom football team. If Jersey is not part of Uefa, it can have very little to do with the rest of the footballing world either," the bid document goes on to state. Football in Jersey has been in decline over the recent years, with fewer people playing the game and a number of clubs folding. "We believe it is the best option for Jersey football in the future," Brookland said. "We're very serious about making the application. Over the last four or five years, if you look at player pathways here for young children, more and more children are involved in playing football. "The issue has always been how far can they go in terms of playing for their clubs and then playing representatively."